Does this work? 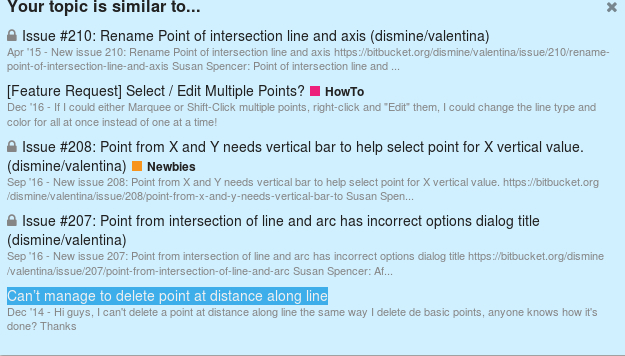 Click on ‘Point at Distance along Line’ Left-click on 1st point Left-click on 2nd point. I think Valentina went into weird mode when you were trying to lasso the second point. This is known problem. Fixed in 0.5.0.
actually, I figured it out. you are correct that there was an issue while i was trying to lasso the second point. Also I did not know that the point must be one of the named points and not someplace I just click. Once I realized that, it got much easier. Also, I went ahead and downloaded version 4.999 and installed it. I am now building the basic sleeve pattern from Don McCunn’s book. I have finished it all except for the curves at the sleeve cap. I am still working on how to shape the curves and I have not figured out how the curve tools work. I also took the liberty of answering another user who was trying to draft a sleeve by some unknown method. He seems very frustrated by the software. Perhaps my example will help. I hope I am able to post this. I tried to post a note to that user (apparently a native French speaker) to apologize for my non existent French skill and whatever attempt comes out of google translate. For creating resizeable patterns, use ‘Curve tool which uses point as control handle’. A fair curve can usually be drawn if the length of control handles equal 1/3 distance between the two endpoints. This is not always what the design requires, but 1/3 length of the line between the two endpoints can be a good place to start when designing a curve – if you don’t like it you can adjust. In many cases the angle of the control handle should match the angle of the line connected to the curve. In other cases the angle of the control handle should be 180degrees opposite from the adjacent line.